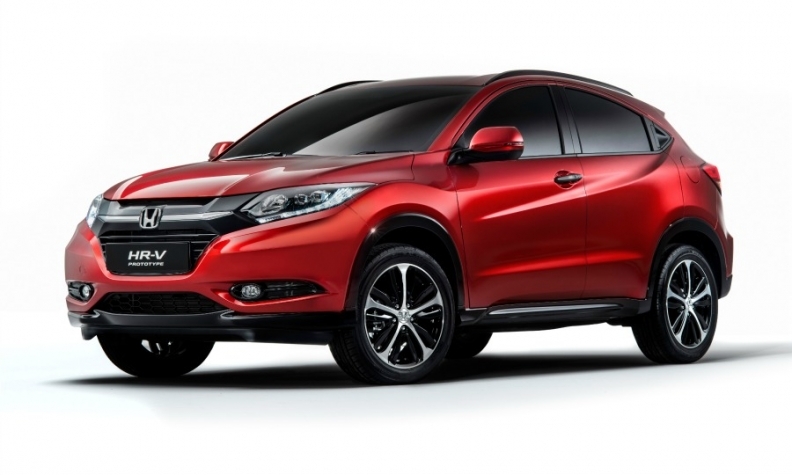 Honda expects the new HR-V subcompact crossover (shown here in its near-production form) to give it a big boost. Honda says new models and a leaner organization will help it rebound in Europe in 2015 after seven years of falling sales and struggles to earn a profit. Japan’s third-largest automaker after Toyota and Nissan has declined from being a major player among Asian brands in Europe to a niche player after its annual vehicle sales fell by more than half since 2007. A combination of job cuts at its UK factory and the launch of a new crossover in one of Europe’s fastest-growing segments should help the automaker increase unit sales and return to profitability in the region. A key launch will be the HR-V subcompact crossover, which will go on sale in Europe next year. Sold as the Vezel in Japan, the subcompact revives in Europe the HR-V name that Honda last used in the region in 2006. Honda expects to win new customers, especially younger buyers, with the HR-V. The model will compete in a segment that IHS Automotive predicts will double in size in Europe to 1 million units by 2020 from a forecast of more than 500,000 this year. Ross declined to give sales expectations for the vehicle, saying only that he hopes the HR-V also will bring down the average age of the automaker’s customers in Europe. IHS estimates Honda will sell about 30,000 units of the HR-V in Europe in 2016, the vehicle’s first full year of availability in the market. Based on existing volumes, that level of sales would make the HR-V the company’s No. 3 seller in the region after the CR-V compact crossover and Civic compact hatchback. Honda also will begin sales of its new-generation Jazz subcompact next year and is making changes to the CR-V to improve its fuel economy in a bid to lure more buyers. The power output of the CR-V’s 1.6-liter diesel will be increased next year to 160 hp from 130 hp, allowing Honda to drop the CR-V’s less frugal 2.2-liter diesel. The company also will equip the CR-V with a nine-speed automatic transmission from German supplier ZF, which already offers variants of the gearbox in the Range Rover Evoque and Jeep Cherokee. Honda needs a sharp sales recovery. The company’s sales in the EU and EFTA markets reached a peak of 313,484 vehicles in 2007, which gave it a market share of 2.0 percent, according to data from industry association ACEA. But last year’s sales of 139,712 represented a share of just 1.1 percent. IHS estimates that the HR-V and the new Jazz will help push Honda sales in Europe up to 163,000 next year and past 200,000 in 2018. Ross wouldn’t predict future sales figures, but said he was aiming for “steady” growth. Jonathon Poskitt, LMC Automotive’s head of forecasting for European sales, said Honda has been hit from below by Hyundai and Kia, which have focused heavily on European-designed cars, and from above by premium automakers that are encroaching onto non-premium turf, a problem that has affected all mass-market players. The company’s only factory in western Europe, in Swindon near London, has been struggling as a result of the brand’s years of declining sales. Although it has an annual capacity of 250,000, the plant built 140,094 cars in 2013. Last year the company stopped using one of Swindon’s two production lines, cutting about 590 jobs. The CR-V, Civic, Civic Tourer station wagon and UK versions of the Jazz are now built on a single line at the plant. In March, Honda again cut production, dropping from three shifts to two, eliminating 160 temporary jobs. Honda will not build the HR-V in Swindon. Instead, European versions will be produced in Mexico. Jazz models for mainland Europe will be built in Japan. The decision makes sense economically since most Mexico-built HR-Vs and Japan-built Jazz models will be sold in markets that are bigger than Europe for Honda, Ian Fletcher, senior analyst at IHS Automotive, said. The HR-V also will be sold in the U.S.